The igHierarchicalGrid control is a hierarchical jQuery Grid control that features filtering, group by, column hiding, paging, column resizing, row selectors, cell selection, sorting, column summaries, tooltips, and updating functionality. For more information on each of these features, see their corresponding API document: igGridFiltering, igGridGroupBy, igGridHiding, igGridResizing, igGridPaging, igGridRowSelectors, igGridSelection, igGridSorting, igGridSummaries, igGridTooltips, igGridUpating. The igHierarchicalGrid control is built on top of the stand-alone flat-data igGrid control. The API for the igGrid control serves as the base for configuring the igHierarchicalGrid control and its columnLayouts settings. See the igGrid control API document for more details. The following code snippet demonstrates how to initialize the igHierarchicalGrid control. The row expanding/collapsing animation duration in ms. If true, will autogenerate all layouts assuming default values for "childrenDataProperty"
When autoGenerateLayouts is enabled, it will automatically generate all columns recursively. (all columns on all levels). 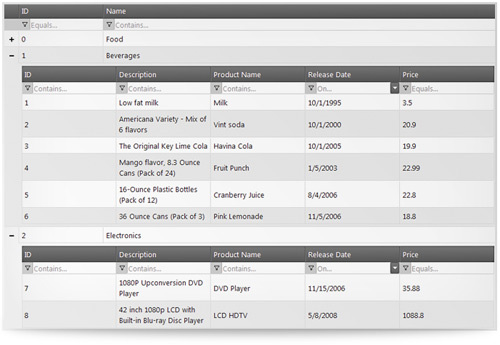 Specifies the default tooltip applied to an expand column cell, that is currently expanded. collapseTooltip: "Custom Collapse Tooltip Text"
List of columnLayout objects that specify the structure of the child grids. All options that are applicable to a flat grid are also applicable here. Specifies the foreignKey of the columnLayout. This is also the column key of the parent grid. Specifies the columnLayout key. This is the property that holds the data records for the current column layout. Specifies the primaryKey of the columnLayout. This also serves as the column key for the current column layout. An array of column objects. Specifies the default property in the response where children will be located. Applies a linear animation - either expanding or collapsing depending on the parent row state. Specifies the expand column width. Specifies the default tooltip applied to an expand column cell, that is currently collapsed. expandTooltip: "Custom expnad tooltip text"
Only the first level will be data-bound initially. Also serves as "render" depth, meaning that depending on this prop, the grid will. No levels will be automatically expanded when the widget is instantiated for the first time. Specifies the limit on the number of levels to bind to. If true, encodes all requests using OData conventions and the $expand syntax. Specifies the delimiter for constructing paths , for hierarchical lookup of data. Event fired after a child grid is created. //type of the event according to the jQuery UI convention: "igchildgridcreated"
Event fired before a child grid is going to be created, allows the developer to override the child grid creation. //type of the event according to the jQuery UI convention:	"igchildgridcreating"
use args.id to get the data ID of the row. use args.parentrow to access the row element for the row that was collapsd. use args.parentrow to access the row element for the row that's about to be collapsed. use args.parentrow to access the row element for the row that was expanded. use args.parentrow to access the row element for the row that's about to be expanded. Returns a flat list of all child grid elements (recursive). Returns a flat list of all child grid widgets (not elements) - recursive. accepts a dom element, or a jquery wrapped dom element that should be a TR and should specify a parent row. Specifies a custom function to be called when parent row is collapsed. Takes 2 arguments - first is hierarchical grid object, second is the row element that was collapsed. returns a boolean value indicating if the parent row specified by the "element" is currently collapsed or expanded. Checks if a parent row is currently collapsed. Commits pending transactions to the client data source for main and all child grids. Data binds the hierarchical grid. No child grids will be created or rendered by default, unless there is initialExpandDepth >= 0 set. Destroys the hierarchical grid by recursively destroying all child grids. Expands (toggles) a parent row. Specifies a custom function to be called when parent row is expanded(optional). Takes 2 arguments first is hierarchical grid object, second is the row element that was expanded. specifies if the row is currently expanded or collapsed. Checks if a parent row is expanded or not. returns a boolean value indicating if the parent row's child grids are populated and created. Checks if a parent row is populated with data. Clears the transaction log (delegates to igDataSource). Note that this does not update the UI. In case the UI must be updated, set the second parameter "updateUI" to true, which will trigger a call to dataBind() to re-render the contents. Whether to perform a rebind. jquery wrapped element of the root grid. Returns the element of the root grid (igGrid). widget object of the root igGrid (not igHierarchicalGrid). Returns the widget object of the root grid (igGrid). Posts to the settings.updateUrl using $.ajax, by serializing the changes as url params. Specifies a custom function to be called when AJAX request to the updateUrl option succeeds(optional). Specifies a custom function to be called when AJAX request to the updateUrl option fails(optional). Expands or collapses (toggles) a parent row. Specifies a custom function to be called when parent row is toggled(optional). Takes 2 arguments first is hierarchical grid object, second is the row element that was toggled. Classes applied to the child grid TD container when it is expanded. Classes applied to the child grid TD container when it's collapsed. Achieves a "dotted-line" effect in between two child grids, excluding first and last ones. Classes applied to the expand button SPAN, when it's collapsed. Classes applied to the expand button SPAN, when it's clicked. Classes applied to the expand button SPAN, when it's expanded. Classes applied to an expanded expand button span, when it's hovered. Classes applied to a collapsed expand button span, when it's hovered. Classes that are applied to the expander column TD. Classes applied when the TD in which the expand/collapse indicator is located, is currently in expand state. Classes applied to the special header cell TH which is for the expand column. Classes applied to the SPAN holding the expand header cell icon. Classes applied to the root grid's table element.